Annie was born on Christmas Eve, in the year 1866, in the little town of Vineland, New Jersey. Eldon and Jean Johnson, the father and mother, welcomed that Christmas present as the greatest earthly gift. The father was of English descent, and the mother was Scottish. The only remembrance of her mother dates back to the time just before her mother's death in 1869 (at the age of twenty-three) following the birth of a baby sister for Annie. She must have looked with wonder from that baby face into the mother's face that day, for it was the only imprint of that mother's likeness that lived in her memory. The baby was left for life-long companionship. The father took the children to board with the widow of an old army comrade who had been killed in the Civil War. It was not a happy arrangement. The woman had two children of her own and her means were very limited. During the two years the Johnson girls added to the cares of that family, they were evidently unwelcome and unwanted. But it was at this time when the outlook seemed so dark for their young lives, that a neighbor interposed in a kindly way. She loomed in the memory as Aunt Susie, although she could claim no blood relation to this friend. Aunt Susie was a school teacher, and boarded near the school in the home of Mr. and Mrs. Flint. She became so strongly attached to the Johnson girls that she was continually speaking of them to the Flints, and at last so aroused their sympathy on behalf of the motherless children, that a little over two years after their mother's death they were adopted by the Flints, whose name thereafter they bore. While their name might sound hard and stony, their hearts were very tender. Two things made Mr. Johnson willing to part with the children: first, he was suffering at the time with an incurable disease from which he shortly afterwards died; second, the Flints offered a home after his own desire. They were Baptists, and Mr. Johnson was very anxious that the children should be brought up in the Baptist faith. Later Annie was converted in a Methodist revival meeting and many of her most intimate friends were connected with those churches. Then as the years rolled by she was helped by men and woman in many branches of the evangelical church, and in return she herself became God's channel of blessing to that wider fellowship. She looked upon that "household of faith" as really one great family, with one faith, one Lord, one baptism, working under one Divine Spirit, having one Master over all. Mr. and Mrs. Flint were true Christians, and love reigned in their home. The two girls were taken right to their hearts, and loved as though they were their own flesh and blood. The daily training was thorough, both in Christian and domestic spheres. When Annie was eight years old the family left the farm and moved into Vineland, New Jersey, but the touch of the country life never left her in all her years. 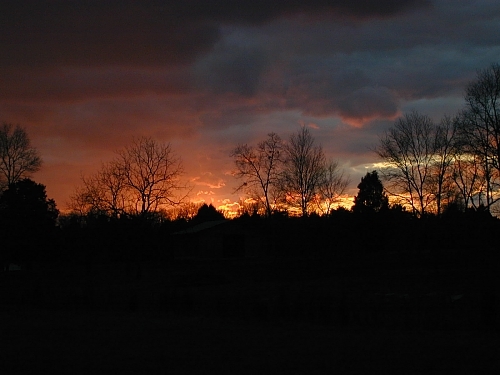 When they reached their new home in town, revival meetings were in progress, and she attended. It was during one of those meetings that the Spirit of God operated upon that young heart and brought her to saving faith in Christ. She always believed that at that time she was truly converted, and while she did not join the church until ten years later, she never doubted that the eternal work was then wrought. She strongly opposed the idea that young children cannot apprehend spiritual truths. She felt that divine mysteries were often plainer to the simple faith of a child than to many adults, blinded by their own prejudices and intellectual doubts. It was not difficult for her to endorse the words of the Master, "thou hast hid these things from the wise and prudent, and hast revealed them unto babes." It was about the time that she passed through this spiritual experience that the poetic interest began to awaken within her. She tells of the thrill of her life when she realized that she could express herself in verse. Then came another move. When she was fourteen the family went to Camden, New Jersey, and there the two girls continued their schooling. There was nothing special to mark the years that flew by in that time. She was very fond of reading, and made good use of her adopted father's library, which contained a good number of the works of standard authors such as Dickens, Kingsley and Bulwer-Lytton, in addition to a majority of the poets. It was at this period that she formed one friendship that continued through the years. This friend told of her early recollections of Annie as she then appeared, "a pretty, dark-eyed girl, with a clear olive complexion, and long black curls. She was kindhearted, merry and vivacious - a general favorite with the boys and girls at school." This friend wrote: "Every Saturday afternoon we met, as a select literary society of two to read our favorite poets, and then we attempted verse ourselves." When this friend moved from Annie's home to another town, we know little of their later companionships though they kept in touch to the close of life. These years were the formative years. It was then she became more conscious of herself as an individual and of her surroundings. She realized, too, her good fortune in having such a home and such foster parents. The Flints were people of high principle. They taught the girls to be self-reliant, independent and economical. They gave her a healthy horror of debt. "Owe no man anything," was a command tacitly obeyed. Mr. and Mrs. Flint provided a good home with plenty to eat and enough to wear, but there was no waste. "Gather up the fragments that remain, that nothing be lost" was a rule strictly observed. By this time she made all her own clothes as well as her mother's, except their best dresses, for which a dressmaker came into the house twice a year. She was also capable of taking charge of the housekeeping if necessary. It was in her girlhood years that she stored up in the child mind the wealth of these things that burst forth in the later years. In those long, long years in which she was "shut in" those nature psalms would never have had the touch that was given to them but for the memories of girlhood when she ran untrammeled under Heaven's canopy and out into open fields and woods. Not that she lost her observation of nature! We remember standing beside her sick-couch one day when she suddenly observed "We are going to have rain today. My robin has just changed his note. He never sings in that tone unless the rain is coming." Sure enough, the rain came. Whether by nature or through her early Christian experience, Annie was generally disposed to be cheerful and optimistic. She looked on the bright side of life, and was quite fond of jokes and able to get much enjoyment out of life. Aunt Susie had often told her that when she was just learning to walk she marched across the room with head up regardless of any obstacle in the way, and a forward looking lifted up head was a characteristic attitude. It was typical of the courage which she was to manifest in later life when she was hemmed in by so many trials. She certainly learned to endure hardness as a good soldier of Jesus Christ. Then she had a generous nature, and was ever ready to share what she had with others, and was ever more willing to grant favors than to accept them. But we are sure that it is a mistake to touch on the commendable characteristic in her life records without lifting the veil on the other side. Annie was very human, and she herself had left a record of the glaring faults as she saw them. While still a child she had a very quick temper which flared up on slight provocation, but as quickly died down. She never claimed entire freedom from this tendency, but she had learned the secret of grace in overcoming. Another characteristic was her acute sensitiveness, which made her keenly alive to the needs and the wrongs of other, and as is usual with one of this nature, her likes and dislikes were intense. She admits further that if she was accused of something she had not done and for which she was unjustly reproved, she indulged in sulky spells which lasted far longer than the storm of temper. She would not speak to anyone while in these moods nor condescend to explain any mistake which might have been made. This was an unfortunate trait in her childhood. But she records her greatest fault as lack of patience, with herself as well as others. She did not like to wait for a thing. She wanted to see results at once. With this there was coupled a dogged persistence and she refused to give up anything once begun, until it was finished. This helped her to accomplish many a hard and distasteful task, but all through her life the hardest lesson she had to learn was patience. Again and again she had to be reminded to wait patiently for the Lord. It was so much easier to wait eagerly and impatiently, or to spend the time making plans and devising schemes for doing something when the waiting time was over. One text that seemed especially written for her was Hebrews 6:12, That ye be not slothful, but followers of them who through faith and patience inherit the promises. Finishing her high school she spent one year at normal school and had a position offered to her. It was a great temptation to begin earning money. But, as her mother was failing in health, and already had had one slight stroke, she felt that she was really needed at home, so she started teaching the primary class in the same school that she had attended as a girl. According to her contract with the normal school she taught for three years, though early in the second year arthritis began to show itself. She tried several doctors in turn, but it steadily grew worse until it became difficult for her to walk at all, and she had a hard time finishing out the third year. After that she was obliged to give up her work, and there followed three years of increasing helplessness. The death of both her adopted parents within a few months of each other left the two girls alone again. There was little money in the bank and the twice-orphaned children had come to a real "Red Sea Place" in their lives. It was just then that the faithful Aunt Susie again came to the rescue. She had been in the Sanitarium at Clifton Springs, [New York] and was convinced that Annie could find help and healing there. Accordingly arrangements were made for Annie to go and she was to have the rent of the house she was leaving for her income. With a pen pushed through bent fingers and held by swollen joints she wrote first without any thought that it might be an avenue of ministry, or that it would bring her returns that might help in her support. Her verses provided a solace for her in the long hours of suffering. Then she began making hand-lettered cards and gift books, and decorated some of her own verses. Her "Christmas Carols" became popular. Two card publishers printed these greetings and this helped to get her foot on the first rung of the ladder of support. It gave her the larger vision of possibly securing openings through some of the magazines, by which her poems could be a wider blessing, and at the same time bring some little return that would minister to her own pressing need. When we [Bingham's] met her first, she had succeeded in placing a number of her poems in the old CHRISTIAN ENDEAVOUR WORLD, and the SUNDAY SCHOOL TIMES had accepted several. From the first her writings appealed to us and we early made them a special feature in the columns of THE EVANGELICAL CHRISTIAN. Testimonies came in from many directions of blessing received, so in 1919 we put forth the first little brochure of her poems, under the title "By the Way, Travelogues of Cheer." Seven of these brochures, ever increasingly attractive, and ever more widely circulated, were issued. 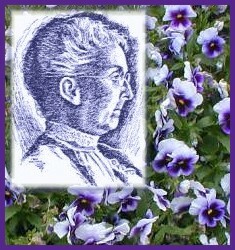 The publications of her booklets and the action of the SUNDAY SCHOOL TIMES linked her up with a world wide fellowship. For a long time she sought to deal with this ministry herself, and to carry the burden of correspondence. One wonders how she could ever get a pen through those poor twisted fingers; but she was a beautiful writer, and a wonderful correspondent. Her letters were unique, bright and breezy, though written from her bed of affliction. They were as rich as her poems, and whatever the stage of her affliction, or however great the pain through which she might be passing, she always had a touch of humor that was refreshing. One of her great regrets in the after years was that the progress of her affliction made it necessary to dictate the messages to her friends and of course this added to her expense. When she could afford it, she liked to go into the Sanitarium for a month or two around the Christmas season. It gave her a little more care and helpful medical treatment and at the same time she came into contact in that institution with a large number of guests who purchased her booklets and cards. One of the lessons which she learned in connection with the life of faith was that she could not dictate to the Lord as to how He was to supply the need. She had been brought up with a sturdy independence. She still struggled to make ends meet. She still sought to cut down expenses in order that she might be able to pay as she went. The thought of charity was obnoxious to her. She loved to give to others and help those who were in need, but to receive from others—that was quite another matter. The breaking down of her prejudice in this sphere came about in a very simple way. One of the boarders staying at the house where she lived, when saying good-bye, tactfully slipped into her hand a gift of money. This was the first time such a thing had ever happened, and Annie's pride was up in arms at once. The woman evidently noticed a difference in her manner and explained that she wished to leave some remembrance with her, but not knowing what her special need might be, thought it better to let her choose. Then she added something which went home. Annie never forgot it. She said, "You know Jesus Christ said 'It is more blessed to give than to receive,' but how can there be any givers to whom the blessing can come unless there are those who are willing to receive? It takes two halves to make a whole" Then she appealed to Annie and asked if their positions were reversed and she had the means, would she not be glad to give? This turned things around so completely that she had to admit that she had no right to withhold from others the blessing of giving. She took the gift so kindly meant, and tried to be a willing receiver if that would help some giver to obtain a blessing. Her life was lived, as someone has said, from hand to mouth, but as she liked to have it expressed, the mouth was hers, and the hand was God's and His hand was never empty. But there came times of real trial and testing. Sales sometimes fell off, and extra needs pressed in. Sometimes for considerable periods she had to have a trained nurse. There were doctor's bills running up, and then too she was under pressure of many other trials; but again it was in these very conditions that some of the heart experiences wrought by them, brought her where she could be a blessing and help to others. One of her sweetest sonnets which she says was born of experience of another would never have found expression if it had not been for her own trials. The special incident that drew it forth was the visit of a little, tired, discouraged deaconess to Clifton Springs. She used to a call and tell her troubles to Annie, and when she left and went back to the west, she wrote saying how blue she felt, and how down hearted, and she didn't see why God allowed such hard things to come into her life. Annie put her answer in a poem. Nothing sweeter ever came from her pen. She titled it : "WHAT GOD HATH PROMISED". In another sphere her friends criticized and challenged her faith. As her story became known far and wide it was natural that she should receive many visitors. Many of these were sincerely interested in her welfare. Among them were some who strongly believed that healing of the body was for every child of God in this life. Their claim was that healing was in the Atonement and purchased for us by Christ, and that everyone who was walking obediently could claim deliverance from physical infirmities and bodily sicknesses. She listened to what they had to say. MORE THAN THAT, she went earnestly and prayerfully to search the Scriptures as to God's will. It was only after a most painstaking study and prayer, and reading of the best writers on this subject that she reached the conclusion that, while God can and does heal in this way in some cases, in others He does not; that He has seen fit to leave some of the most triumphant saints deeply afflicted. She saw too that many of those who pressed their theory were themselves afflicted with infirmity, and while telling others that they ought to claim healing, bore in their own lives the failure of their theory. Annie became thoroughly convinced that God intended to glorify Himself through her, in her weak, earthen vessel, and like Paul she had three times and more prayed that this might be taken from her, there came to her with real assurance the promise which said, "My grace is sufficient for thee: for my strength is made perfect in weakness." She reached the place where she could also say with Paul, "Most gladly therefore will I rather glory in my infirmities that the power of Christ may rest upon me" [2Cor. 12:9]. Annie determined that there was to be "no moaning of the bar when (she) put out to sea." The last years of her life brought her no ease from her affliction, no lessening of pain and suffering. Yet, we think that those closing years she really exemplified more than ever some of the sweetness of her earlier verses. In Annie's own notes from which this sketch of her life is written, her affliction receives little notice. She would have it so. Although crippled, she did not consider herself helpless and that she could do nothing but bemoan her lot. She believed that God had laid her aside for a purpose, even though that purpose was obscure to her at times, but she also believed that He had work for her to do and she put her very best into the writing of her poems, rendering this ministry unto Him. The result has been that her verses have an unusually deep appeal to human hearts. The simple reason is that she felt what she wrote, and out of the crucible of suffering she was able to administer that comfort to others wherewith she herself had been comforted of God. In ceaseless iteration storm the sky. Less than a week before her passing, Mrs. Bingham and Mr. Stock, with whom Annie had had most of the correspondence about the publication of her poems, called to see her, in early morning. The nurse gave her "no" to the request for an interview, but when the name was passed in, she said it mattered not whether it was morning, noon or night, nothing should keep them out of her chamber. And for an hour they had delightful fellowship. There was no thought then of the immediate passing. But on Thursday morning, the following week, September 8th, 1932, she felt very tired and wondered if she could live the day out. When the doctor was called he stated that it was just weakness. But all that day she did not improve and the doctor was called again in the evening. He saw at once that she was in great distress and her heart was behaving badly. Before giving her a hypodermic he asked if there was anything she wished to say or have her friend do as she might not rally. Her last words were: " I have nothing to say. It's all right." A few minutes later she had gone to be with Christ, sorrow, pain, suffering and death were ended forever, for the former had passed away. 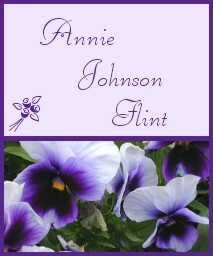 In considering the life of Annie Johnson Flint one is perplexed with questions as old as humanity itself, such as the mystery of pain and suffering. That the wicked should suffer as the reward for their wrong doing seems just and right, but that the righteous should pass through the furnace, sometimes heated seven times, is a great stumbling block to many people. That is because we only see half the circle of life. One thing we are sure of, and that is that the Divine Potter makes no mistakes as He molds the clay in His hands. When it comes forth from His hand, He has fashioned it indeed, a goodly vessel prepared and fit for the Master's use.